These front end loaders are designed for Australian conditions featuring excellent visibility, durable performance and solid construction that allows you to handle bigger tasks and longer hours. The mechanical level lift system is the best form of operator protection against “rollback” and is designed to meet latest standards for Supply and Manufacture of Front End Loaders. Designed with service access and visibility in mind the excellent visibility to the bucket is thanks to the loaders mid-mount design, narrow boom arms and small uprights. All key pivot points are fitted with heavy-duty bushes. These can all be lubricated from the side of the loader, with easy to see recessed grease points. The 3rd service allows the operator to remotely operate an additional hydraulic circuit on an attachment. This is controlled by the operator from a switch on the joystick. Hydro ride provides a smoother, cushioned ride by reducing the energy transfer back and forth between the loader and the tractor. The kit installs cleanly and does not restrict the operator’s vision. This option is available for Prime-Lift 10C or larger. Alternate attachments with the multiattach quickcoupler system on the Prime-Lift C.
Quickly level your attachment with the easy-to-use levelling gauge on the Prime-Lift C.
Attaching or removing your front end loader from your tractor is simple with a Prime-Lift C.
The Prime-Lift front end loaders have stood the test of time and provide customers with a front end loader range that meets performance requirements whilst also providing a more economical product. Prime-Lift front end loaders have been operating on farms for many years and are a proven performer. With extra options available for increased functionality, it is a complete loader offering with many valuable features that will compliment your tractor usage and versatility. Protect the front of your investment with a bump guard or grille guard. Some tractor models have available, the fold down grille guard, this provides a more compact and functional design. The Aus Hitch quickcoupler is a specifically designed attachment system used for coupling all attachments, using the Aus Hitch system, quickly and efficiently. The quickcoupler uses a single lever action to disengage the locking pins from the attachment and has a spring return auto lock function when reattaching to an attachment. The Aus Hitch is designed with much larger and stronger locking pins in comparison to the Euro Hitch. The Euro Hitch quickcoupler has been developed to allow those customers, who may have previously purchased European-style attachments that suit some of the European-manufactured loaders, the ability to retain those attachments and use them on their Prime- Lift or Vision-Lift front end loader. The quickcoupler uses a single lever action to disengage the locking pins from the attachment and has a spring return auto lock function when reattaching to an attachment. The 3rd and 4th service allows the operator to remotely operate additional hydraulic circuit(s) on an attachment. This is controlled by the operator from a button on the joystick. The multicoupler is useful for easier hydraulic coupling of the loader, on and off the tractor. The use of a multicoupler also increases operator ease of use when changing third and fourth service dependent implements from quickcouplers. With the carefully designed hydraulic locking quickcoupler system fitted to your Vision-Lift front end loader, you can switch between your power log grab and another attachment with far more ease. Flush pin design and hidden hydraulic hoses increases loader to tractor clearances and provides clean boom arm surfaces free from hoses, brackets, fittings and other components. The cross bar cover design is made with a heavy duty high-density polyethylene material, protecting hoses and valving mounted underneath the cover. This stylish cover is designed to maximise operator vision. As a world-first, Challenge Implements has developed the patent pending CLT™ front end loader levelling system with an innovative internal self-levelling linkage enclosed inside the loader boom. With years of development, Challenge is able to conceal the linkage inside the boom arm which gives the loader a better appearance and gains between 240mm to 260mm of increased vision. This makes for a streamlined and compact front end loader, while continuing to offer safety to the operator with the use of advanced level-lifting technology. The patent pending Auto Cam Lock and Fast Lock frame stand system, included with the Vision-Lift series front end loader, provides operational savings by reducing the time and effort required when detaching and reattaching the front end loader from the tractor. There are no components that have to come away from the loader as the automatic locking features are all built into the design. Reattaching the loader is now a very quick, automated process. Once the hydraulic hoses have been connected, the operator can completely attach and secure the loader without leaving the tractor seat. With the development of the patented EES™ system, the Vision-Lift loader now has greater strength while also allowing the entry and exit points of the hydraulic hoses and wiring harness. One of the main areas of any front end loader that needs extra strength is the cross bar that joins the two boom arms together. The new EES™ cross bar system offers an added total of a 56% increase in cross bar re-enforcement, now allowing a total of six high-penetration welds from the boom points that protects and guides the hoses and wiring within the loader boom arm. These castings have been designed to offer maximum strength to the surrounding area of the hydraulic hose entry and exit points. The cross bar cover design is made with a heavy duty high-density polyethylene material, protecting hoses and valving mounted underneath the cover. This stylish cover is designed to maximise operator vision. Buckets are a useful tool for collecting, lifting and moving materials around the farm. Different types of buckets get particular jobs done right and safely. Just to name a few, light material bucket, rock bucket and silage grab bucket, are all specialised in handling certain materials. Designed to meet the high strength and safety requirements of today’s environment. When attached to one of our front end loaders there is no rollback. For the ultimate in versatility, the multipurpose 4-in-1 bucket when fitted with 3rd service, it becomes more than a bucket; it’s a blade, a grab and a grader as well. The silage grab bucket has been designed to handle loose or fine chop silage and is ideal for cleaning up other loose materials such as straw. Useful for levelling, general clean up, sifting rocks and other debris from soil leaving clean fill that can be used for other purposes, and more. One of the front end loaders more popular tasks on a large property is lifting, carrying and stacking hay bales. With a large range of hay handling attachments for our front end loaders, this job is made simple. Maximise safety and efficiency by combining these attachments with other products. This attachment combined with a round bale spike attached to your loader, increases your efficiency and maintains safety. With a simple tine change you have two attachments in one. Both attachments are designed to handle a single bale. Consider a 3-point linkage dual round bale spike to double the amount of bales you can handle at one time, totalling up to 6 bales. Ideal for handling square bales, this attachment comes as two types, standard and extra wide ideal for export hay bales. Lifting, carrying and stacking silage is made a lot easier with our selection ofsilage handling attachments. Some of these attachments are designed with smooth surfaces which is ideal for preventing damage to wrapped silage. This attachment is designed to allow the smooth and efficient handling of wrapped silage bales and round hay bales. Handling pit silage easily and safely. This attachment requires a 3rd service to activate the grab portion of the attachment. The silage fork is ideal for handling pit silage and other light materials. The tines are fitted into a tapered sleeve and are removable. The bull blades are available with root rakes allowing ripping and removal of roots. When utilising its other configurations, the bull blade can level loose material and manage water runoff gradients. The bull blade can be inverted through an adaptor on the rear of the blade. This will position the rake tines towards the ground, allowing ripping and removal of small tree and shrub roots from beneath the ground surface. Alternatively, when pushing up debris, the tines allow topsoil to be left behind. The bull blade can also be set up with a manual angle adjustment and a manual tilt adjustment. These are set through brackets supplied and attached to the back of the blade, allowing the operator to change from a standard configuration to either or both angle and tilt options. The bull blade can also be set up with a manual angle adjustment and a hydraulic tilt adjustment. The manual angle is set using the bracket supplied and attached to the back of the blade. The tilt is controlled through a hydraulic third service which the operator can control during use. The power log grab has loader attachment lugs welded directly to the attachment frame making it a stand-alone attachment to allow for quick efficient changeover. A third service is required to activate the grab arm of the attachment. Additional pallet forks are available to increase the load bearing surface area. The post hole digger includes a carriage, drive unit and auger; available in different configurations. The hydraulic post hole digger drive unit is operated by a 3rd service from the front end loader to drive whichever size auger is fitted. The operator controls the loader arms to provide downward pressure while drilling the hole, or by raising the loader arms to lift the auger out of the hole. The post hole digger is supplied with a one piece attachment carriage. The drive unit can be positioned to the left, right or centre of the carriage to suit individual needs. There are a number of drive units to best match the tractor’s hydraulic capacity and auger sizes to suit any job. All augers come standard with replaceable tungsten carbide cutting teeth and pilot. A 3-point linkage counterweight is highly recommended with your front end loader to ensure stability, improve safety and performance of your equipment. 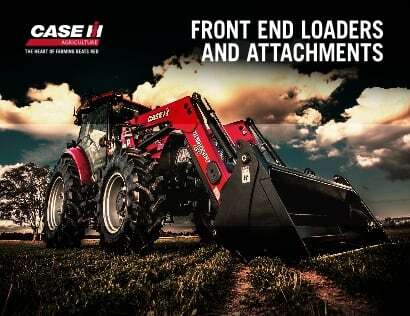 Learn more about the great machinery from Case IH. It's only available in red! Your Case IH dealer is your local expert for machinery sales, parts and service. Find your local Case IH dealer.